“We actually met on Tinder. It wasn’t soon after matching I asked her for her number, she responded with “well I’m new to this, so let’s just stick to talking on here for a while…” Feeling slightly defeated, yet intrigued, we just kept talking on Tinder. A few days later and a couple conversation Brooke ended up asking me out. “Hey, since you live in Durham, and I live in Durham we should go to a Durham Bulls game or something.” I suggested exchanging numbers again, to make the planning process a little easier. IT WORKED! After she proposed the idea of getting together, and we exchanged number, the planning for our first date began. We talked about a few different ideas before we settled on Mt. Fugi, a sushi place in Brightleaf square in downtown Durham, on June 30th. I was very early and beat her there, even though she was also, early compared to what we had originally said. We had a few rolls of sushi, and I just talked and talked and talked- boy, I was nervous. I paid the bill, but didn’t want the evening to be over. I asked if she wanted to get desert somewhere. To my excitement she said yes, and suggested a place she heard was good. It must not have been that good, because when we walked to it, it was closed… for good. We walked around a little bit more, and came across a place called the cupcake bar. They had small little cupcakes, so we were able to try all of them- probably 6 or so. They were about to close, so we took them to go, and walked across the street to Bayu café. We ordered a turtle mocha each, and started to enjoy the cupcakes. Our waiter was very kind, so I offered him one, and to our surprise he actually took one. Our coffee came out, and shortly after a jazz band started to play. LOUDLY! At that point I couldn’t hear anything Brooke was saying, so I asked if I could come sit next to her. With a cute little nod, I stood up to walk over to her and knocked into the table, spilling the majority of her coffee. We talked more, enjoyed each other’s company, and then walked back to her car. I jokingly said “ I want to kiss you right now, but I won’t”, really just feeling her out if she wanted to be kissed. She had me so nervous, something I usually wasn’t when it came to girls. I gave her a hug bye, and we went our separate ways. She texted me when she got home, and I immediately asked her out for another date. I just wanted more of her. 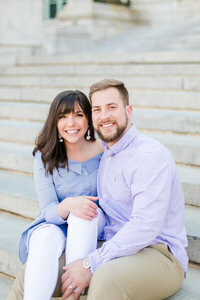 View more of our favorite engagement sessions here!